For $17 you get 134 page ebook and a bunch of supporting audio and video files to play along with and learn from. Basically every example in the book has a supporting video and audio file for you. The videos serve as a guide to help you with the concepts and the audio files double this up but there are also some backing tracks for you to play over which are great if you’re looking to work on your scales for example, or maybe to help improve your improvising. The book starts out at around beginner level dealing with shuffle strumming and getting straight into a standard 12 bar blues pattern in the key of C. If you know a few chords, can strum a bit then you should be good to go with this book. It doesn’t quite start at zero but it’s pretty close. In total there are 23 main sections which start with blues patterns and strumming before moving onto riffs, techniques, scales and improvising. It’s well thought out and has a natural flow. At the end of each chapter/section you get a round up of what has been covered and some playing challenges too. I really like the playing challenges which push you beyond just playing through the progressions in the book. These challenges can be anything from transposing a progression to coming up with and playing your own bend licks. I think one of the main things that I really like about this book is that it’s really comprehensive. There’s a lot to work on here and it’s not something you’re likely to blast through in a couple of weeks. I myself keep coming back to it and still wouldn’t say that I’ve got to grips with everything here. The book is well designed and nicely presented and with it being delivered in PDF format you can obviously zoom in and out should you want things a little bit clearer. That’s maybe one criticism I might level at the layout/presentation, I think the text size could maybe do with increasing throughout. Maybe that’s just me though as I do tend to read on my phone quite a bit (and most people think that is just plain weird). Everything here is (excluding the cover) is set on a white background which is a smart move. Not enough ebooks do this and are difficult to print as a result. That’s not the case here. If you want to print it out (and I’d recommend you do) it’s not going to consume all your printer ink. 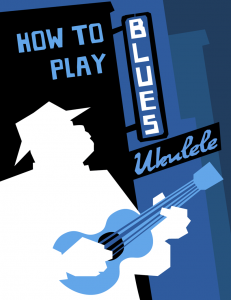 This is a great ebook that I’d definitely recommend even if you have a passing interest in playing the blues on your ukulele. I wouldn’t particularly consider myself a big blues fan but I got (and still get) a lot from the book. It’s so packed with information and ideas that I think pretty much everyone will find something useful here. A definite buy recommendation from me! *If you do choose to buy How To Play Blues ukulele, the links in this article are affiliate links which help to keep Ukulele Go making new content. I’m hoping to get some blues playing down over the weekend! Hey Frank, the core principles all apply but the chord boxes and tab would be all out of sync with the baritone obviously having a different tuning. If you don’t mind doing the work, it would probably teach you quite a lot to print out the pages and rework the chord boxes for the baritone. Hope that helps. Thanks I may do that……..
Let me know how you get on Frank! I also play the baritone and am looking at this book. Have you heard from Frank , has he ordered the book and tried transposing the chords ?